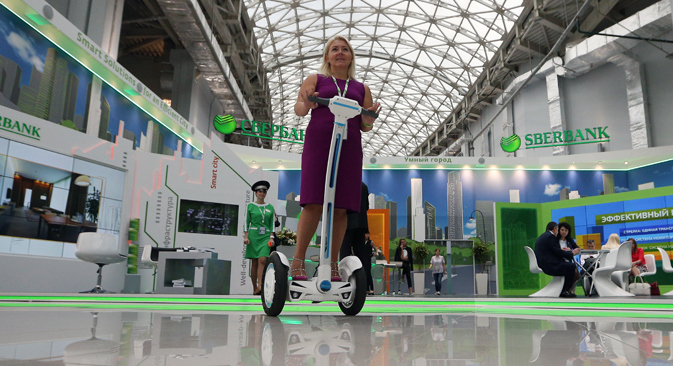 Participants of the recent International Investment Forum in Sochi say that U.S. and EU sanctions on Russia are impeding international investment in innovative start-ups, with foreign companies not aware of what they can do under the new conditions. Meanwhile, according to Russian observers, several new innovative clusters may be created in Russia, including in Sochi. The sanctions imposed by the United States and the European Union on Russia over its role in the Ukraine conflict are hindering international investment in innovative start-ups, according to a spokesman for Russia’s Skolkovo Foundation science and tech development center. Speaking at the 2015 International Investment Forum in Sochi on Russia’s Black Sea coast, which finished on Oct. 4, Pekka Viljakainen, advisor to the Skolkovo Foundation's president on the startup environment, said that the "sanctions are written in such an unclear way that many investors do not know whether they can buy a ticket to Russia, and certainly are not sure whether they are allowed to invest in Russian projects." "The biggest problem in connection with the sanctions is that potential investors in Europe and the U.S. do not know what they can and what they cannot do in Russia. Therefore, it is important to confirm that the investment in start-ups does not fall under sanctions," he said at a session organized with the support of the Open Innovation forum. According to Oleg Fomichev, deputy minister of Economic Development of Russia, innovation in Russia is mostly developing in specially created clusters – industrial parks, business incubators or special economic zones. In the future, Fomichev said, such clusters – of which there are 26 at present – may be created in other regions of the country, for example, in the Krasnodar Region in the south, where Sochi is located. Thanks to the subtropical climate, the former capital of the Olympic Games could become the center of Russia's "Silicon Valley,” he said. However, according to Minister of Communications Nikolai Nikiforov, out of 85 Russian regions, only about 20 are engaged in innovation. "First and foremost, it is a question of attracting talented businessmen and engineers, creating the institutional conditions for business development," he said. In particular, a program for the construction of industrial parks in the field of innovative technologies was completed in Russia in 2014, and a total of 750 residents are already working at such sites. According to Nikiforov, it is necessary to meet three conditions for the development of innovation – the creation of a comfortable environment, the availability of human capital and interest in research & development on the part of state-owned companies. "In Russia, the share of state presence in the economy is large, and where state-owned companies invest in innovation, life will be going swimmingly," said Nikiforov. According to Alexei Komissarov, head of the Industry Development Fund, innovation could become a mechanism for attracting investments in a specific region. "In an era of global technological revolution, technologies have become a stronger currency than money," he said. However, according to Viljakainen, attracting investment is important, but not the only factor for the development of innovation. "If all issues were resolved by money, Saudi Arabia would be the most innovative country in the world, but to date no one uses any product from Saudi Arabia except oil," he said. Viljakainen considers the interaction of startups with the international community as a key factor for the development of innovation. "There are virtually no foreigners among the founders of the companies that are residents of Skolkovo – as a result, Russian developers do not know how to commercialize their product," he said. According to him, "every startup should focus on the world market, just when it is at an early stage of development."